Also serving communities of Wimberley. There are 8 Assisted Living Facilities in the San Marcos area, with 3 in San Marcos and 5 nearby. The average cost of assisted living in San Marcos is $3,775 per month. This is higher than the national median of $3,346. Cheaper nearby regions include Kyle with an average starting cost of $3,422. To help you with your search, browse the 40 reviews below for assisted living facilities in San Marcos. On average, consumers rate assisted living in San Marcos 4.5 out of 5 stars. Better rated regions include Seguin with an average rating of 4.7 out of 5 stars. Caring.com has helped thousands of families find high-quality senior care. To speak with one of our Family Advisors about assisted living options and costs in San Marcos, call (855) 863-8283. San Marcos, a city in the Austin metropolitan area, has been growing rapidly since 1950. In 2013, Business Insider ranked San Marcos at the ninth spot on its "10 Most Exciting Small Cities in America" list. Additional features of San Marcos that senior citizens may find attractive include its three assisted living facilities, with another six in nearby towns like Kyle and Wimberley. These facilities generally provide assistance with daily living activities, such as eating and grooming, and they are licensed and regulated in Texas by the Department of Health and Human Services. San Marcos’s climate rates 70 out of 100 for comfort, since it has a large number of sunny days with low humidity. The summer heat may be a concern for seniors who spend time outdoors, as the average high temperature in July is 95 degrees Fahrenheit. The average low temperature is about 39 degrees in January. The overall cost of living in San Marcos is 13 percent below the national average and 3 percent below the Texas average, making it a more affordable location for seniors on a budget. Housing is particularly inexpensive, at 22 percent below the national average. All other living expenses, including groceries and utilities, are also below the state and national averages. The crime rate in San Marcos is 22 percent above the national average and has increased by 8 percent each year. However, the rate of violent crime is 19 percent lower than average for Texas. The prevention of property crime should therefore be the highest priority for seniors in San Marcos. San Marcos Transit operates wheelchair-accessible buses along seven routes Monday through Friday, with stops at popular locations like Walmart and Springtown Mall. Seniors pay half fare. San Marcos has an array of community resources for seniors, including activities sponsored by the Parks and Recreation Department for seniors 50 and over. The Game Day Club plays cards and board games at the San Marcos Activity Center every Monday except holidays. Other regular programs include adult education, health checks and social activities. The San Marcos area is home to world-class medical facilities, including Central Texas Medical Center, in the event of medical emergencies or illness. Assisted Living costs in San Marcos start around $3,775 per month on average, while the nationwide average cost of assisted living is $4,000 per month, according to the latest figures from Genworth’s Cost of Care Survey. It’s important to note that assisted living rates in San Marcos and the surrounding suburbs can vary widely based on factors such as location, the level of care needed, apartment size and the types of amenities offered at each community. 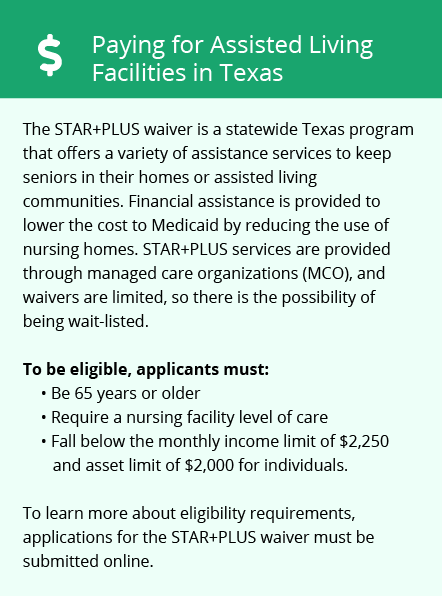 Seniors may be eligible for financial assistance for assisted living through the Texas Community Care for the Aged / Disabled program and the STAR+PLUS program. San Marcos and the surrounding area are home to numerous government agencies and non-profit organizations offering help for seniors searching for or currently residing in an assisted living community. These organizations can also provide assistance in a number of other eldercare services such as geriatric care management, elder law advice, estate planning, finding home care and health and wellness programs. To see a list of free assisted living resources in San Marcos, please visit our Assisted Living in Texas page. 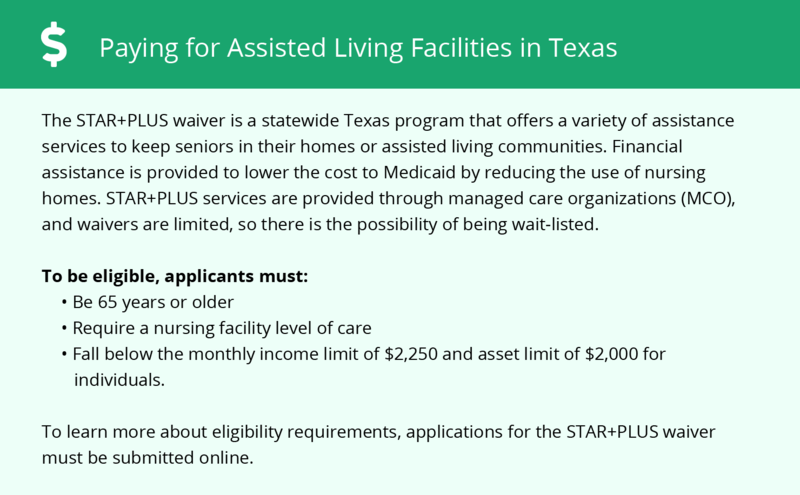 San Marcos-area assisted living communities must adhere to the comprehensive set of state laws and regulations that all assisted living communities in Texas are required to follow. Visit our Assisted Living in Texas page for more information about these laws.